The Democratic front-runner ventured where his rivals haven’t dared, and notched an hour of positive publicity. BETHLEHEM, Pa. — Bernie Sanders entered the Fox’s den on Monday night — and he not only survived the hour-long encounter, but often dominated. In the days preceding the event, Sanders faced backlash from liberals who said he shouldn’t participate given the network’s nativist bent and cheerleading for President Donald Trump. But when it was over, Sanders had received an hour of positive exposure on the highest-rated cable channel — something none of his primary rivals have yet risked. The town hall took place in a cultural center in the shadows of a former steel mill here, in a county in Pennsylvania that voted for Trump after twice supporting Barack Obama. But the room was packed with Sanders supporters, and the Vermont senator fed off the energy of the crowd. Still, the image of an audience on Fox News rallying behind the democratic socialist and his left-wing platform gave Sanders the appearance of strong support in an area that was key to the president’s victory in 2016. For the Sanders campaign, it was an ideal end to a four-day swing through the industrial Midwest that was meant to show that he’s the presidential candidate best positioned to beat Trump. Significant numbers of Democratic primary voters are more concerned with a candidate’s ability to win than his or her ideology, according to recent polls. 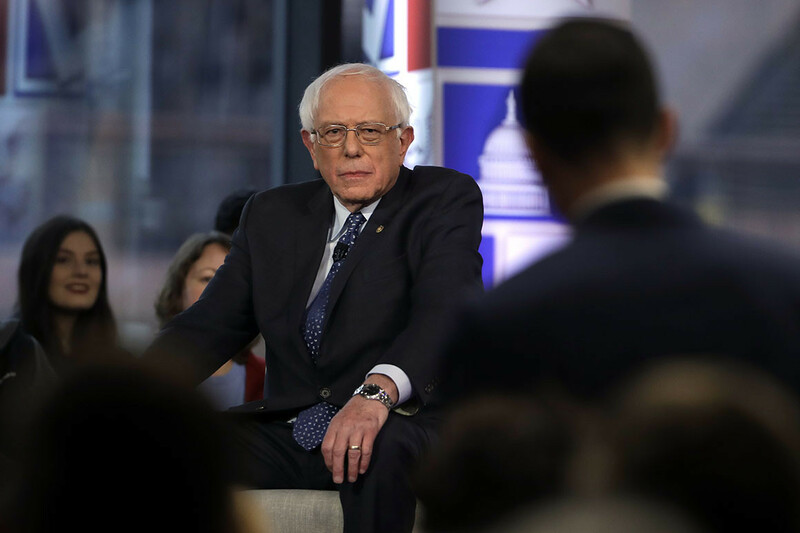 Some of the difficult questions asked by the hosts, Bret Baier and Martha MacCallum, were about Sanders’ “Medicare for All” plan. When asked how he would fund the program, Sanders didn’t shy away from the fact that many Americans would pay more in taxes. But he insisted the “overwhelming majority” would end up spending less money overall because they would not pay for deductibles or other out-of-pocket costs. He also downplayed concerns that people would be kicked off their insurance, arguing that millions already lose their health insurance when they get fired from or quit their jobs. One of the most surprising moments of the town hall occurred when Baier asked the members of the audience to raise their hands if they received health insurance through their employer. Most indicated they did. Then he asked how many would be willing to switch to Sanders‘ plan, and most people appeared to raise their hands again. Sanders was also quizzed at length about his wealth. A half-hour before the town hall, he’d released 10 years’ of his tax returns, which showed that he first earned more than $1 million in annual income during the 2016 presidential campaign, in part thanks to proceeds from his books. However, he pushed back strongly against the implication that it is hypocritical for him to be a millionaire. “If anyone thinks I should apologize for writing a bestselling book, I’m sorry, I’m not going to do it,” he said, adding that he “voted against Trump’s tax bill” — an overhaul to the tax system that has been criticized as largely benefiting the wealthy. Throughout the exchange, Sanders was largely able to stick to his message when asked about his income, charitable giving and personal taxes, saying that companies such as Amazon were paying nothing in federal taxes and that wealthy people should contribute more in order to alleviate poverty. He drew criticism from some liberals, meanwhile, for remarks he made when questioned about the U.S.-Mexico border. In addition to “sensible immigration reform,” he called for “building proper facilities” on the border and “many, many more judges” to expedite hearings for migrants. As Sanders traveled to Rust Belt states that were essential to Trump’s victory this weekend, he called on the president to keep his vow to working-class Americans and ditch the new NAFTA agreement. If elected, Sanders also said he would deny government contracts to companies that outsource jobs to other countries, such as General Motors. Sanders had a similar message throughout the Fox News town hall. He attacked Trump, arguing that he didn’t keep his campaign promise to be a different kind of Republican and avoid cutting programs such as Medicare and Medicaid.